Doe, a deer, a female deer as the song goes… The song reminds us of the movie shot in a scenic, hilly place. Deer are part of the song maybe because they signify friendliness, elegance, and spring. Deer are one of the most favorite forest animals especially in the North America. No wonder many people like them in their yards or try to get them to stay longer in nearby observable spot. How do you attract the deer? First is to know what deer eat. 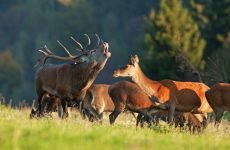 Deer are herbivores which means that they eat anything that comes their way—grasses, leaves, twigs, nuts, oats, acorns, etc. Their favorite foods are vegetables, flowers, and ornamentals which often startle homeowners with damaged crops in the morning. One way to attract deer is to provide them. A deer feeder is filled with food so that deer will come to it. It entices them to stay longer, enough time for you to observe them. It is usually made with a food tray where food falls from the container. The container comes in different capacities depending on the feeder. Sometimes, the feeder is equipped with LCD display and a programmable feature on how often you want to release food from the container. This feature is economical because it allows you to control the amount of food you give the deer. One economical deer feeder is the classic tripod design of the Moultrie Deer Feeder. It is one of the best-selling feeders today. What makes it stand out among the other brands? Learn more about this model by reading about its features, pros, and cons. The Moultrie Deer Feeder Classic Tripod is equipped with a plastic quick lock hopper that comes with a 5.5-foot fill height. It is durable and easy to assemble because it can be interchanged with Moultrie feeder kit. Made from ultra violet resistant plastic, the Moultrie Deer Feeder Classic Tripod is made durable and resistant to breakage. The Moultrie Deer Feeder Classic Tripod also comes with notable features like a feed level estimator, and external power port. It requires only 1 6- volt battery to power the motor. The Moultrie Deer Feeder Classic Tripod gets high ratings in online stores and reviews. Among the list of features above, it is followed by advantages. Does it have any disadvantages? Find out below. Deer are beautiful to observe. That is why many people have developed passion in taking photographs of deer; other people hunt them. However, it is a challenge to make deer stay long in one spot. As prey animals, deer are always on the move. They quickly move to the next spot. They are most active at night too. So, how do you make them stay longer or invite them into your yard? One effective way is to feed the deer with a deer feeder. A feeder can provide food so they will be attracted to an observable spot and provide a reason for them to return for more food. One high-rated deer feeder is the Moultrie Deer Feeder. It is made with durable, UV-resistant plastic that is strong and resists breakage. No additional tools are required for assembly, so it is easy to put together. Plus, it is interchangeable with Moultrie feeder kits. To make it more convenient, theMoultrie Deer Feeder Classic Tripod features a photocell timer that allows you to program up to 2 feed times in a day. It stands steadily because of its square locking legs. Aside from its great price, it is economical because it comes with varmint guard to prevent other wildlife from eating the deer food. 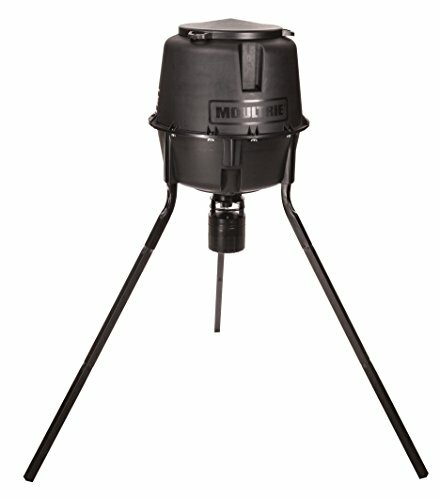 If you are looking for a reliable and economical feeder, the Moultrie Deer Feeder Classic Tripod it is.